This is one of my very favorite Magritte paintings, however; it is called La Condition Humaine (“The Human Condition”) and was painted in 1935 (to distinguish it from a painting of the same name painted in 1933). Again and again, he used the device of hiding the object that he was painting. 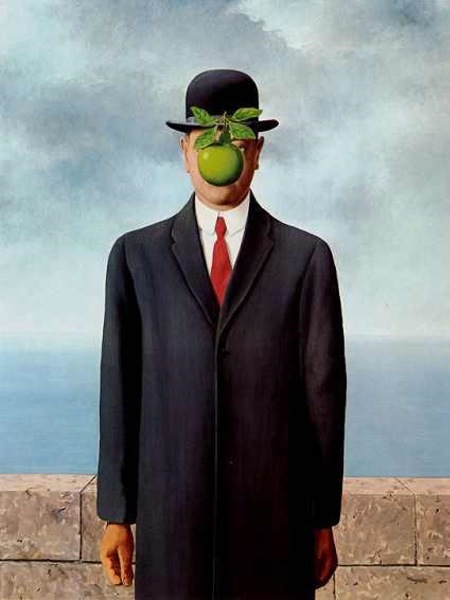 An example of this would be Le Fils de l’Homme (“The Son of Man”)—a self-portrait with a green apple obscuring his face. With “La condition humaine,” Magritte is obscuring what is behind the easel with an exact representation of what it is obscuring. Very clever, right? And beautiful! It is wonderful to imagine that this photograph was taken before 1933 when Magritte first did this (as far as I know). Of course, it is also wonderful to think that some artists were trying to do Magritte in the real world. In addition to the photograph, there is a certain anti-art going on here, because anyone standing where the camera was at that time got to see this wonderful piece of ephemeral art. It is also possible that it is a fake. It could be a collage or worse. Regardless, I am interested in finding out. The problem is, that she seem to misunderstand the painting. Magritte was not being ironic. He was making a comment about painting (or photography). The truth is, The Treachery of Images is not a pipe; it is a bunch of dried paint on a canvas that looks like a pipe; in other words, it is a painting of a pipe. This may not seem to be a very interesting point, but there is actually a lot here. Images are just that: images. They only become meaningful in the mind. Everyone knows that painting that (depending upon how you look at it) is two faces or a single vase—or another that is an old woman or a young woman. Nothing changes in the painting, ever; but depending upon the state of your mind, everything changes. Maddow used Magritte’s painting to good effect, but that effect depends upon trivializing the painting. I am not saying that everything is just a matter of how you look at it. I believe there is some absolute reality. For example, The Treachery of Images is most definitely oil paint dried on a canvas. Also: the current protests in Wisconsin are most definitely about union rights. But Magritte’s painting: it is most assuredly not a pipe. This entry was posted in Visual Arts by Frank Moraes. Bookmark the permalink.